The five pence (5p) coin (Irish: cúig phingin) was a sub-division of the Irish pound. It was introduced in Ireland on Decimal Day, 15th February 1971 and re-used the design on the shilling coin first produced for the Irish Free State in 1928. Due to the similarity in size and weight, many of the old shillings coins remained in circulation until the early 1990s, when the new (smaller) 5p coin was released. The Irish decimal fivepence coin matched the British five pence coin and they were minted by The Royal Mint until the breakup with Sterling in 1978/79. This coin was also similar in size and weight to the German Deutschemark and many Irish student and immigrant workers will fondly remember bringing bags of them over to Germany to get significant discounts in vending machines. In monetary terms 1DM – approx. 7 x 5p coins, so the temptation to obtain cheap phonecalls, cheap train tickets and cheap cigarettes was just too tempting for some. As a modern coin, the coin’s physical dimensions were large relative to its value and a new, smaller type was introduced in 1992 – no doubt, much to the relief of the German vending machine operators. Similar to the introduction of the new (smaller) 10p coin in 1993, one has to wonder why no small 5p coins dated 1991 were found – no doubt, the P&T (Eircom) would have had to re-calibrate and test their coinboxes in the 1991. To date, no 1991 5p coins have been reported. 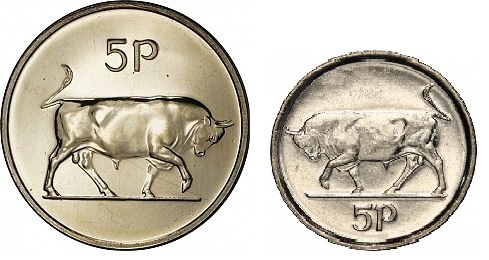 Maybe there was enough time in early 1992 to do the testing before the new coins were released into circulation by the Central Bank of Ireland..
Apart from the obvious difference in size/weight on the Type II Ireland 5p coin, the bull on the reverse side faces left. Although none of the Irish decimal 5p coins are rare, collectors eagerly seek out hitherto unrecorded errors and varieties. The following are just some of the spectacular errors that exist – I shall be adding more as I find them. That sounds like a nice coin. Please send me a photo. Hello, I have a 1971 5P Irish coin- can I send you a photo to learn more about it? If you read these three articles, you will discover a lot more about your coin.